On the 75th anniversary of the Soviet red army's defeat of the German fascist army in the Siege of Leningrad, a memorial event took place in the Russian Cultural Center in Beijing on January 28, drawing the participation of around 200 people. 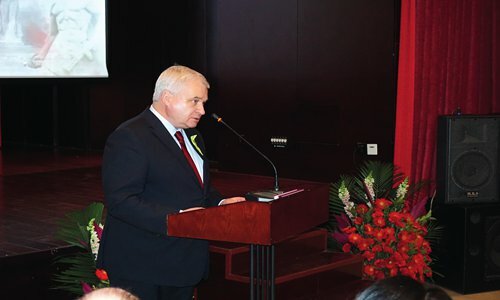 The Russian Ambassador to China Andrey Denisov gave an opening speech. The representatives from the embassies of Tajikistan, Kazakhstan, Azerbaijan, Armenia, Belarus and Kyrgyzstan in Beijing and the Shanghai Cooperation Organization participated in the event. Also at the event, the representatives from the foreign ministry, the Chinese People's Association for Friendship with Foreign Countries, the Association of Chinese Teachers Of Russian Language and Literature, and the Soviet branch of the Western Returned Scholars Association attended the event. Some historical WWII photos of Leningrad were exhibited and songs were presented at the end of the event.